Six months ago the Guardian Media Group called time on its regional news pilot Guardian Local, but it is continuing to experiment in the local market, its latest venture being n0tice, a location-based online notice board to share and read news and notices. The hyperlocal website and mobile site is currently in private beta, with a team of three at GMG along with an army of contributors helping to shape the online version of the village notice board. Others who want to get involved will soon be able join. n0tice was born out of a Guardian hack day and has SoLoMo, a trend towards social, local and mobile, at its heart, but as it does not currently have Guardian branding it feels more like an independent start-up than a child of the news outlet. The platform is a space for people to buy and sell, like the classifieds section of a local newspaper, and can be used for general notices, local news and liveblogs or updates posted by citizen reporters as community news breaks. It is like a reverse Foursquare, where rather than checking in to a business or venue, you allow your computer or mobile to grab your location information and the site finds the community groups, items for sale and news near you. Listing on n0tice is free but users get the option to pay for a featured post. Pricing is yet to be confirmed but the figure currently being worked with is a charge of £1 for each mile radius from the seller’s location per day. 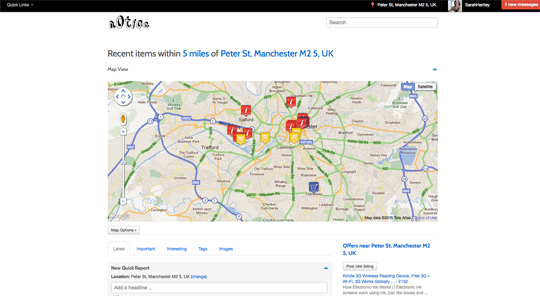 The site, which can be used worldwide and white labelled, will be given free to hyperlocals and sold to commercial ventures, such as anyone who wants to use the technology to set up a location-based site, according to community strategist at GMG Sarah Hartley, who was head of online editorial at the Manchester Evening News and later launch editor of the now defunct Guardian local experiment. And of course, being a Guardian platform, it has an open API. Along with Hartley, who this week spoke about n0tice at the Brighton Future of News Group, two others are working on the development of the platform: Matt McAlister, who is director of digital Strategy (who in May announced n0tice with this thorough explainer) and developer Daniel Levitt (whose blog is here). One of the areas the team is looking into is how to best reward users who contribute, with a current system in place of an ‘Editor’ badge which goes to the first user in an area. The next round of users will be invited into the platform soon soon, with a planned release of the site next year. You can sign up to be one of those by entering your email address here, you can follow @n0tice on Twitter and get involved by joining this Flickr group and “celebrate noticeboards” by contributing photographs. This entry was posted in Business, Citizen journalism, Hyperlocal and tagged daniel levitt, Guardian Media Group, Matt McAlister, n0tice, notice, Sarah Hartley, The Guardian on October 19, 2011 by Sarah Marshall.